Marjorie Mollenauer is a classically trained harpist with many decades of experience performing on the stage, for weddings of all religious groups, and for many other kinds of social events. She has performed at Carnegie Hall and in many other concert venues here and abroad. Marjorie has a vast repertoire of not only classical music, but of Broadway tunes, opera, and popular music. She invites brides to come to her house in Colts Neck to listen to her play and to select music for their weddings. 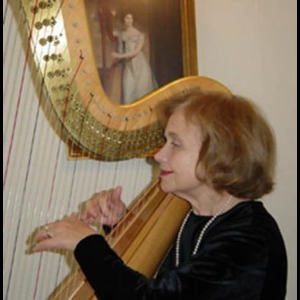 She is also a master teacher of the classical harp and is one the top harpists in the New Jersey- New York- Philadelphia metropolitan area. Finally, she regularly works with other outstanding musicians (flute, violin, cello) when that is requested. Absolutely beautiful music provided for the wedding ceremony! Highly recommend! Marjorie is such an absolute sweetheart! Couldn't be happier with booking her for our special day. She was so accommodating let us come to her home to listen to the music before choosing our songs. Got so many compliments on how beautiful the music was! Thank you Marjorie! Marjorie Mollenauer is a superb and gave a glorious performance at my daughter's wedding. She was skilled in both classical and contemporary music, which the guests thoroughly enjoyed both at the ceremony and the reception. I whole heartedly recommend her. Marjorie was absolutely wonderful. My guests really enjoyed her performance. I would highly recommend her!! She is a lovely and sweet woman and her harp playing sound beautiful! Marjorie has been a pleasure to work with the minute I received the quote from her. She invited me to her home to play for me and helped me tremendously in picking my songs for my wedding processional and recessional. I'm so happy with the way things turned out. I wish I could have listened to all the songs playing in the church but being the bride doesn't allow for that! Marjorie is wonderful and I would recommend her for anyone's wedding or other special event. I am one very happy bride! 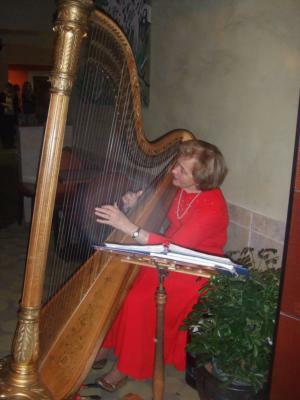 All of my guests and I loved, absolutely loved, Marjorie Mollenauer's harp playing. Marjorie is a wonderfully talented musician. She was a pleasure to work with right from the start. We contracted with her for my daughter's wedding ceremony and cocktail hour. She was able to fullfilll all the musical requests of my daughter and her husband regarding ceremony choices (both contemporary and classical choices). Here bid was reasonable and I would recommend her for any event. Please note Marjorie Mollenauer will also travel to Perth Amboy, South Amboy, Sayreville, Edison, Lincroft, Piscataway, Marlboro, New Brunswick, Eatontown, Holmdel, Farmingdale, Freehold, Morganville, Plainfield, Red Bank, Shrewsbury, Westfield, Wickatunk, Avenel, Elizabeth.